You know, people have made fun of this invention, some even have derided it as cruel. However, I can see some dogs I have known kind having fun. Maybe only for short trips, I admit. 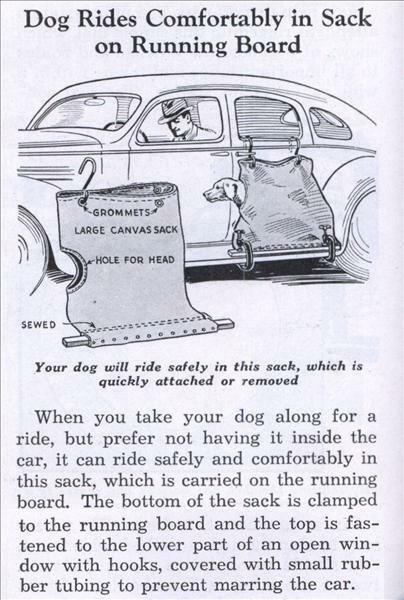 And I’m certainly sympathetic to the fact that dogs can wreak havoc inside a car, as a distraction, making trouble. Clearly, this is not a product that stood the test of time. Joe Crawford blogged this at 7:11am in 2008 in March. The 21st was a Friday. You are reading this 11 years later. Comment. There is one comment Tweet. Send email. It has hashtags→ advertising funny . genius, really. But given that many now equate dog life to human life, I don’t really see it taking off.